In this study of James chapter 1, we learn how Christians are to deal with trials and temptations that undoubtedly will come our way. We also learn that we are to be not only to be hearers, but doers of the Word of God. Your learning comes from reading and studying the Bible. 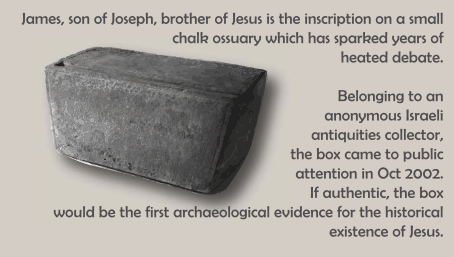 After you've read the Scripture passage below, it's a good idea to answer the daily study questions. God Bless and enjoy your study! Oh, by the way check out the fun quiz at the bottom of the page. In James chapter 1 verse 1, this epistle is addressed to “the twelve tribes which are scattered abroad.” Various commentators provide insights on this point. Probably the most insightful is that of D.J. Moo provided in the Zondervan Illustrated Bible Backgrounds Commentary. From that reference we learn that the "Twelve Tribes" might suggest that James is writing to an audience of Jews or Christian Jews. However, Moo points out that this language had become symbolic of the people of God and was generally used of Christians. Moo thinks the language of the letter suggests a Jewish-Christian audience. Moo points out these are the typical troubles exiles faced from Jews who were unhappy with their allegiance to Jesus as the Messiah. 1. James addresses his readers as the twelve tribes. What are two other ways he addresses them here in James chapter 1? One's a term of affection and the other's a vision of what they should become. 2. In James chapter 1 verse 2 we're told to consider it pure joy when we're surrounded by temptations. every kind of evil against you because of Me. Be glad and rejoice, because your reward is great in heaven. We're not talking here only of our choices here, but of our attitudes and mindset toward the inevitable temptations we face in life. From the readings of Matthew 5:11-12, Romans 5:1-5, and James 1:2-4, how can we be joyful when we are tempted? 3. If you were to flowchart or map the words or concepts of James chapter 1 verse 3 and Romans chapter 5 verses 4 and 5 that are related it could look something like the chart below. Fill in the blank with the concept keywords from the verses as they build upon one another from left to right. What's the power that allows these concepts to work together and what's the end result? 1. James chapter 1 verse 12 brings up the topic of trials or temptations we saw in verses 2, 3, and 4.
simply choosing to please ourselves rather than the God who created us and loves us. Here in James chapter 1 verse 12, James tells us that some Christians who are tempted will receive a crown of life. Which Christians receive the crown from the Lord? Where else does the Bible talk about a crown of life? 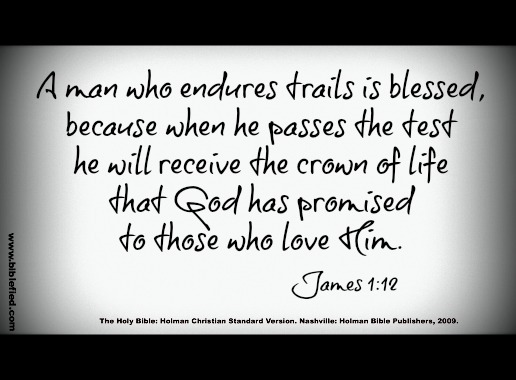 In that passage, what trials are Christians encouraged to endure? 2. Consider the instruction we receive in James chapter 1 verses 5 through 8. Rewrite in your own words how one acquires wisdom based on this instruction. 3. What's the lesson of James chapter 1 verses 9, 10 and 11? How can one who's poor be proud and one who is rich be humble? 1. From a reading of James chapter 1 verses 13 through 18, James was addressing a doctrinal error that stated that one is tempted by God to sin. Why doesn't it make sense to believe that one could be tempted of God? Why would someone wish to claim he or she was tempted by God? 2. Why can’t God be tempted? 3. The two possible consequences of our temptations as provided here in are a crown of life (verse 12) and death (verse 15). In verses 14 and 15 we learn that we're all tempted away from fellowship with God by our own lust or desires which lead to sin. What can we do to avoid sin? What does God’s Word tell us to do? 1. What's meant by the term “first-fruits” in verse 18? 2. 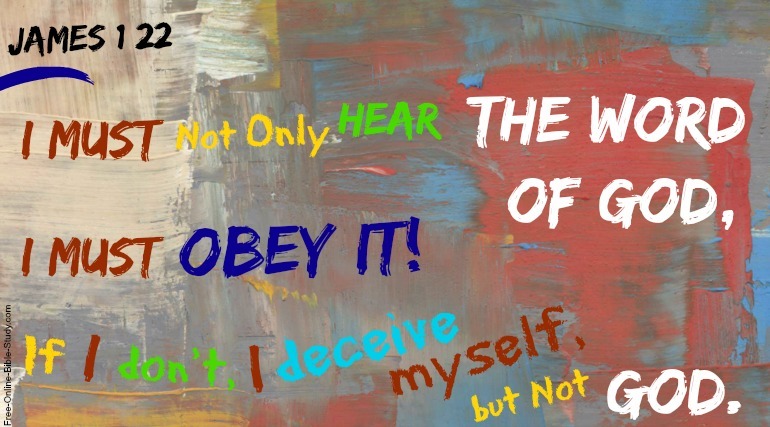 Why should we be swift to hear and slow to speak as James teaches us in verse 19? What're three things we can do to become “faster” hearers and “slower” speakers? 1. James chapter 1 isn't the only place God teaches us about our tongues. Study these verses from the Book of Psalms. Psalm 5:9 - For there is no faithfulness in their mouth; their inward part is very wickedness; their throat is an open sepulchre; they flatter with their tongue. Psalm 10:7 - His mouth is full of cursing and deceit and fraud: under his tongue is mischief and vanity. Psalm 50:19 - Thou givest thy mouth to evil, and thy tongue frameth deceit. Psalm 52:2 - Thy tongue deviseth mischiefs; like a sharp razor, working deceitfully. Psalm 52:4 - Thou lovest all devouring words, O thou deceitful tongue. Psalm 109:2 - For the mouth of the wicked and the mouth of the deceitful are opened against me: they have spoken against me with a lying tongue. Psalm 120:2 - Deliver my soul, O LORD, from lying lips, and from a deceitful tongue. Psalm 120:3 - What shall be given unto thee? or what shall be done unto thee, thou false tongue? What are the concepts and whom is being spoken of with these references to evil or unbridled tongues (vs. 26). Do you see any patterns? 1. Study these verses below. Psalm 35:28 - And my tongue shall speak of thy righteousness and of thy praise all the day long. Psalm 37:30 - The mouth of the righteous speaketh wisdom, and his tongue talketh of judgment. Psalm 39:1 - I said, I will take heed to my ways, that I sin not with my tongue: I will keep my mouth with a bridle, while the wicked is before me. Psalm 51:14 - Deliver me from bloodguiltiness, O God, thou God of my salvation: and my tongue shall sing aloud of thy righteousness. Psalm 71:24 - My tongue also shall talk of thy righteousness all the day long: for they are confounded, for they are brought unto shame, that seek my hurt. Psalm 119:172 - My tongue shall speak of thy word: for all thy commandments are righteousness. What are some ways we can use our tongues, our ability to speak, our mouths, and ability to communicate that are in alignment with the Word of God?